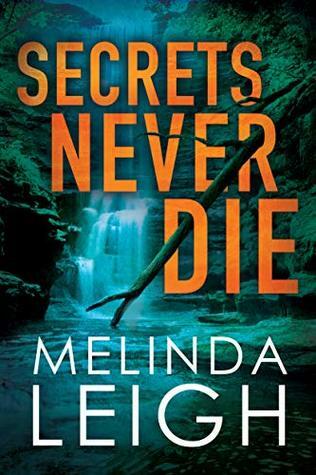 Secrets Never Die by Melinda Leigh is the fifth installment of the thrilling romantic suspense Morgan Dane series. Each book in the series features a new case to solve so they could be read as standalone novels if choosing to do so. However, there is character development that carries over book to book so it’s always best to read the series as a whole. This series is also a spin off of another of the author’s but I have not read the first and never noticed anything missing from these novels or felt as if I had missed anything. This newest case for the team to solve comes when there is a murder and the teenage step son of the victim goes missing. The mother contacts and hires Morgan, Lance and their partner, Sharp, to find her son when she is determined that he is also a victim and had been kidnapped but police turn him into a suspect for the murder. This entire romantic suspense series has been a favorite of mine from the beginning. Each read is action packed and oozing with suspense from the opening pages until the very end. These are also lighter on the romance side with a slowly developing clean romance storyline carrying over from book to book which is a nice change of pace for a genre that usually rushes the relationships to the steamy side. With this series I’ve definitely become a fan and will continue reading any from Melinda Leigh. #1 Amazon Charts and Wall Street Journal bestselling author Melinda Leigh is a fully recovered banker. A lifelong lover of books, she started writing as a way to preserve her sanity when her youngest child entered first grade. During the next few years, she joined Romance Writers of America, learned a few things about writing a novel, and decided the process was way more fun than analyzing financial statements. Melinda’s debut novel, She Can Run, was nominated for Best First Novel by the International Thriller Writers. She’s also garnered Golden Leaf and Silver Falchion Awards, along with two nominations for a RITA and three Daphne du Maurier Awards. Her other novels include She Can Tell, She Can Scream, She Can Hide, She Can Kill, Midnight Exposure, Midnight Sacrifice, Midnight Betrayal, Midnight Obsession, Hour of Need, Minutes to Kill, Seconds to Live, Say You’re Sorry, Her Last Goodbye, Bones Don’t Lie, and What I’ve Done. She holds a second-degree black belt in Kenpo karate; teaches women’s self-defense; and lives in a messy house with her husband, two teenagers, a couple of dogs, and two rescue cats. Yay, this one is coming up for me hopefully this week. I am so glad it is as good as the others in the series. Nice review Carrie.